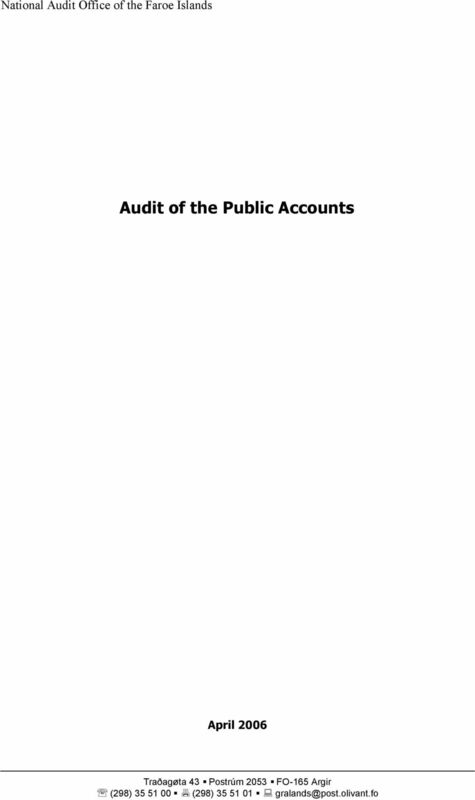 Download "Audit of the Public Accounts"
3 National Audit Office of the Faroe Islands 3 Audit of the Public Accounts 1 Legislation The general rules governing the audit of the public accounts are stipulated in 45 of the Administration Act. Detailed rules are laid down in Parliamentary Act No. 25 of April 21 st, 1999 governing the audit of the Public accounts. 2 The Parliament's Audit Committee The Parliament's Audit Committee is comprised of four members of the Faroese Parliament. The Parliament's Audit Committee shall scrutinize the Public accounts and other accounts submitted by public institutions, etc. and shall ascertain that the accounts are correct and in compliance with granted budget appropriations. Furthermore, an evaluation shall be made as to whether sound economic management has been applied. The Parliament's Audit Committee shall table a motion for a resolution before Parliament for approval of the accounts, together with their observations. 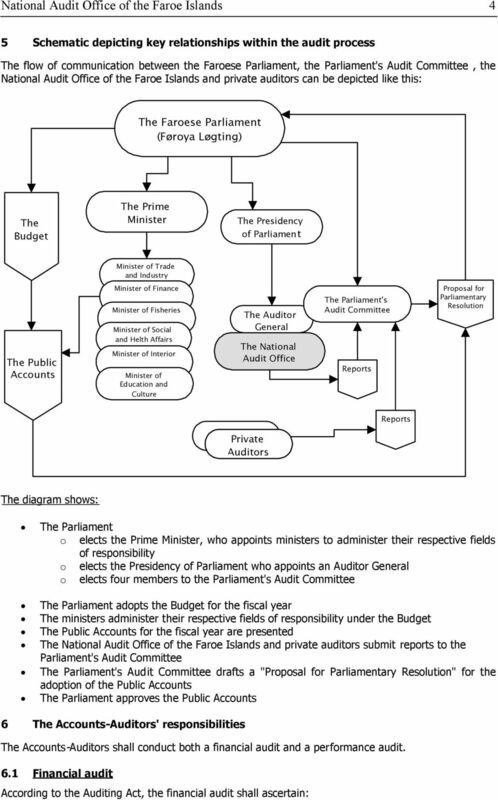 3 The Auditor General The Presidency of Parliament appoints an Auditor General to be in charge of the audit. The Auditor General also serves as the secretary to the Parliament's Audit Committee. The Auditor General is independent in the performance of his duties and hires and manages his own staff. 4 The Accounts-Auditors The task of the Parliament's Audit Committee Auditors, who are: is based on reports submitted by the Accounts- The National Audit Office and State Authorized Public Accountants and Registered Public Accountants. 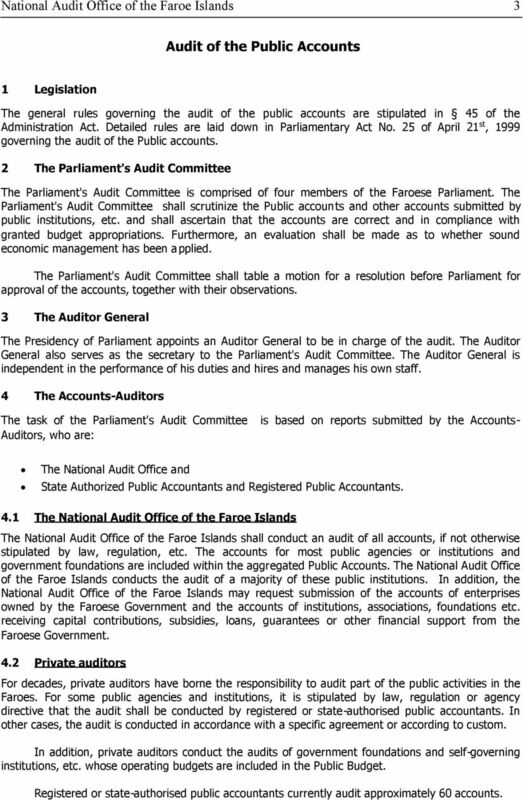 4.1 The National Audit Office of the Faroe Islands The National Audit Office of the Faroe Islands shall conduct an audit of all accounts, if not otherwise stipulated by law, regulation, etc. The accounts for most public agencies or institutions and government foundations are included within the aggregated Public Accounts. The National Audit Office of the Faroe Islands conducts the audit of a majority of these public institutions. In addition, the National Audit Office of the Faroe Islands may request submission of the accounts of enterprises owned by the Faroese Government and the accounts of institutions, associations, foundations etc. receiving capital contributions, subsidies, loans, guarantees or other financial support from the Faroese Government. 4.2 Private auditors For decades, private auditors have borne the responsibility to audit part of the public activities in the Faroes. For some public agencies and institutions, it is stipulated by law, regulation or agency directive that the audit shall be conducted by registered or state-authorised public accountants. In other cases, the audit is conducted in accordance with a specific agreement or according to custom. In addition, private auditors conduct the audits of government foundations and self-governing institutions, etc. whose operating budgets are included in the Public Budget. Registered or state-authorised public accountants currently audit approximately 60 accounts. 5 National Audit Office of the Faroe Islands 5 that all Government revenues are entered into the accounts and that the expenditures are in compliance with granted budget appropriations, that the accounts are correct, and that the proper accounting systems and control activities have been established, that the transactions entered in the accounts are in compliance with the granted budget appropriations, applicable legislation, regulations, agreements and/or customary practice. 6.2 Performance audit According to the Auditing Act, the ordinary performance audit is stipulated accordingly: Furthermore, an evaluation shall be made as to whether sound economic management has been applied to the administration of the funds and the running of the operations covered by the accounts. The ordinary performance audit involves an examination of how stipulated tasks have been carried out, taking into consideration the aspects of economy, efficiency and effectiveness. 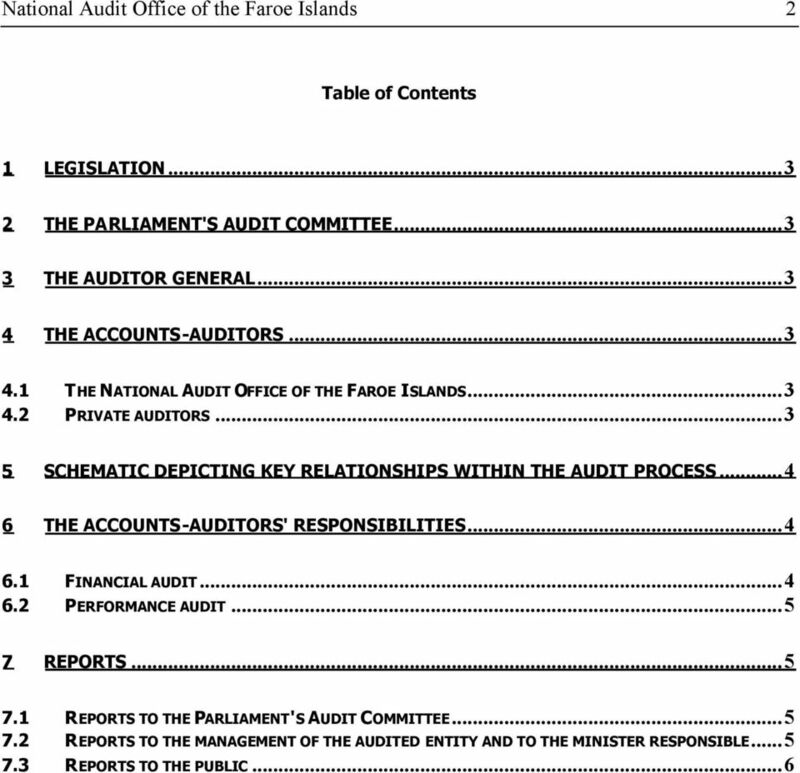 Furthermore, the Parliament's Audit Committee may require the auditor to prepare reports on an extended performance audit in certain areas of the accounts, and they may require the National Audit Office of the Faroe Islands to draft reports on extended performance audits for all accounting areas. 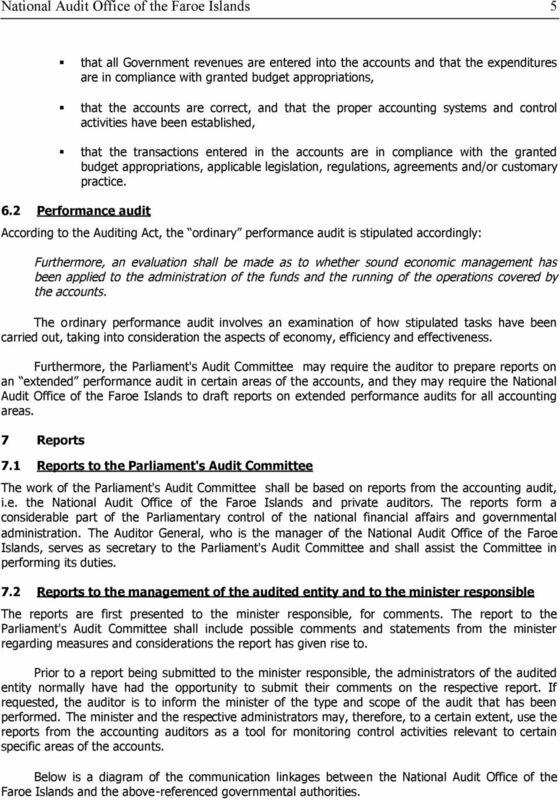 7 Reports 7.1 Reports to the Parliament's Audit Committee The work of the Parliament's Audit Committee shall be based on reports from the accounting audit, i.e. the National Audit Office of the Faroe Islands and private auditors. The reports form a considerable part of the Parliamentary control of the national financial affairs and governmental administration. The Auditor General, who is the manager of the National Audit Office of the Faroe Islands, serves as secretary to the Parliament's Audit Committee and shall assist the Committee in performing its duties. 7.2 Reports to the management of the audited entity and to the minister responsible The reports are first presented to the minister responsible, for comments. The report to the Parliament's Audit Committee shall include possible comments and statements from the minister regarding measures and considerations the report has given rise to. Prior to a report being submitted to the minister responsible, the administrators of the audited entity normally have had the opportunity to submit their comments on the respective report. If requested, the auditor is to inform the minister of the type and scope of the audit that has been performed. The minister and the respective administrators may, therefore, to a certain extent, use the reports from the accounting auditors as a tool for monitoring control activities relevant to certain specific areas of the accounts. 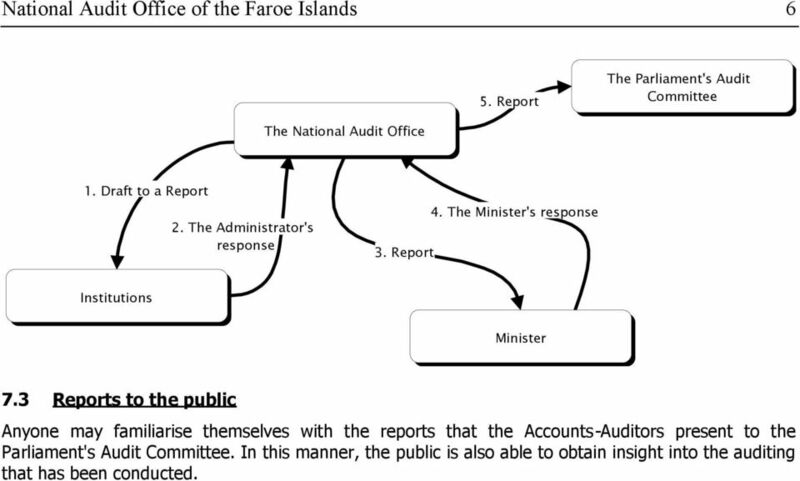 Below is a diagram of the communication linkages between the National Audit Office of the Faroe Islands and the above-referenced governmental authorities. 6 National Audit Office of the Faroe Islands 6 5. Report The Parliament's Audit Committee The National Audit Office 1. Draft to a Report 2. The Administrator's response 3. Report 4. The Minister's response Institutions Minister 7.3 Reports to the public Anyone may familiarise themselves with the reports that the Accounts-Auditors present to the Parliament's Audit Committee. In this manner, the public is also able to obtain insight into the auditing that has been conducted. COUNTY OF COOK Bureau of Human Resources 118 N. Clark Street, Room 840 Chicago IL 60602 Job Code: 0110 Job Title: Director of Financial Control I Salary Grade: 20 Bureau: Finance Department: Revenue Dept. QUESTIONNAIRE FOR DRAFTING ORGANIZATIONAL DOCUMENTS OF A CALIFORNIA LIMITED LIABILITY COMPANY 1. Name of the New Company: The name must include the phrase "Limited Liability Company" "Ltd. Liability Company,"
What are job descriptions for nonprofit board members?